It's not all lettuce and cucumber. If you think salads mean unsatisfying bowls full of bitter lettuce with a less-than-average dressing, you're not alone. The majority of us think of salads this way -- probably because someone at some point said salads have to be bland in order to be healthy. Boo. Yes, salads can be extremely boring -- but they don't have to be. 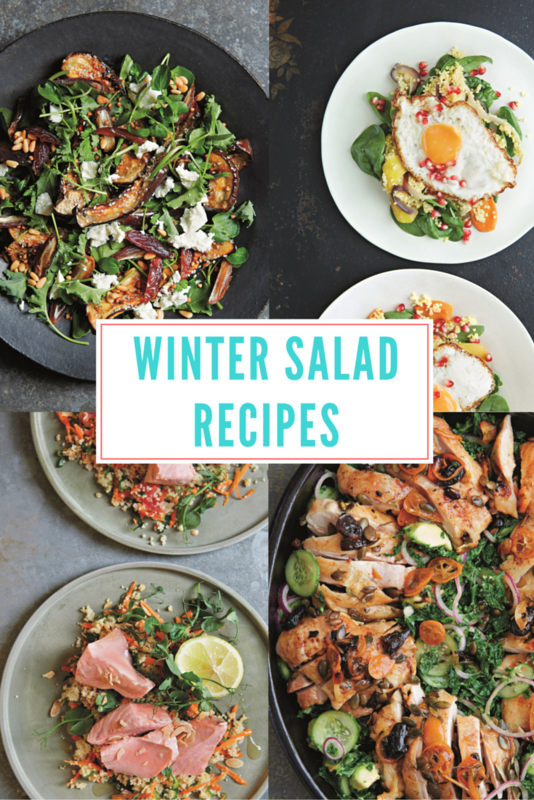 These winter salads from Savour: Salads for all Seasons by Peter Gordon are a good case in point. Chock-full of filling roast veggies, chicken or fish, these salads are meals, not measly side dishes. They use an array of delicious spices and herbs -- as well as sweet and tart fruits -- to create a powerful, balanced flavour. That's right, you can win friends with salad. This winter salad is all about big flavours -- a delicious mix of both sweet and savoury. The miso (yep, it's not just for miso soup) adds a salty, umami sensation and complements the Middle Eastern inspired flavours with its toffee-like dates and tahini yoghurt dressing. You'll never see salads the same again. Serves six as a starter. 1. Preheat the oven to 180°C (350°F/Gas mark 4). 2. Mix the miso paste with the mirin to loosen it, then stir in the sunflower and sesame oils. Brush the mixture thinly on the cut sides of the eggplant. Sprinkle on the sesame seeds. Place on a baking sheet and bake for 20–30 minutes. The eggplant is cooked when you can squeeze it with little resistance. 3. Mix the tahini to a slurry with the orange juice. Stir in the yoghurt, orange zest and one tablespoon of the olive oil, then season with salt. 4. Toss the salad leaves with the remaining 1 tablespoon of olive oil and divide among your plates. 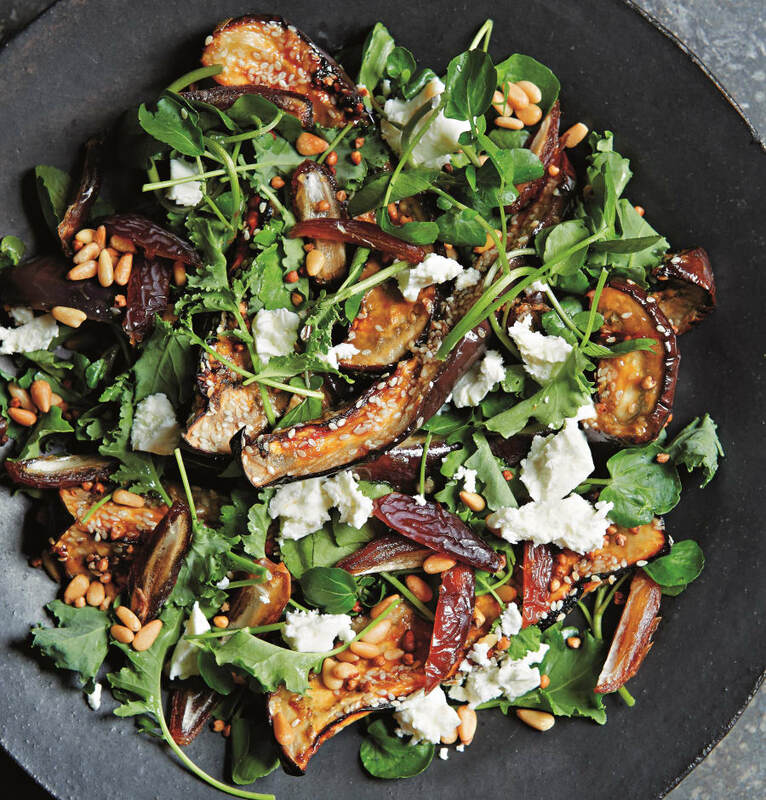 Sit the eggplant on top, then scatter with the dates, feta and crispy buckwheat. Finally, drizzle over the tahini yogurt, or serve it separately and sprinkle with the crispy buckwheat and toasted pine nuts. "You can make this up to a week in advance and store it in an airtight container. The quantities given here will make more crispy buckwheat than you need for this dish, but once you've tasted how good it is you'll be sprinkling it onto everything from a simple green salad to a beef stew," Peter Gordon said. "Whole buckwheat should be easy to find at a health food store, but as an alternative you could use toasted nuts or pumpkin seeds to give crunch to the dish." 1. Pour 500ml (2 cups) of hot (but not boiling) water over the buckwheat in a bowl and leave for six hours or overnight. 2. Drain into a sieve, then pat dry on a kitchen cloth. 3. Pour enough oil into a medium pan or frying pan, about 24cm diameter, to give you 2cm depth. Place over a medium heat and when the oil reaches 150°C (300°F) add the drained buckwheat. 4. Fry gently, stirring frequently, until the grains begin to stop sizzling and have turned golden brown. Drain in a heatproof sieve or small-holed colander, then lay it on baking paper, sprinkle with flaky salt and leave to cool. Once the oil has cooled you can strain and reuse it. This salad is a delicious balance of salty, sweet and creamy. This is a light, healthy meal that doesn't taste as such. 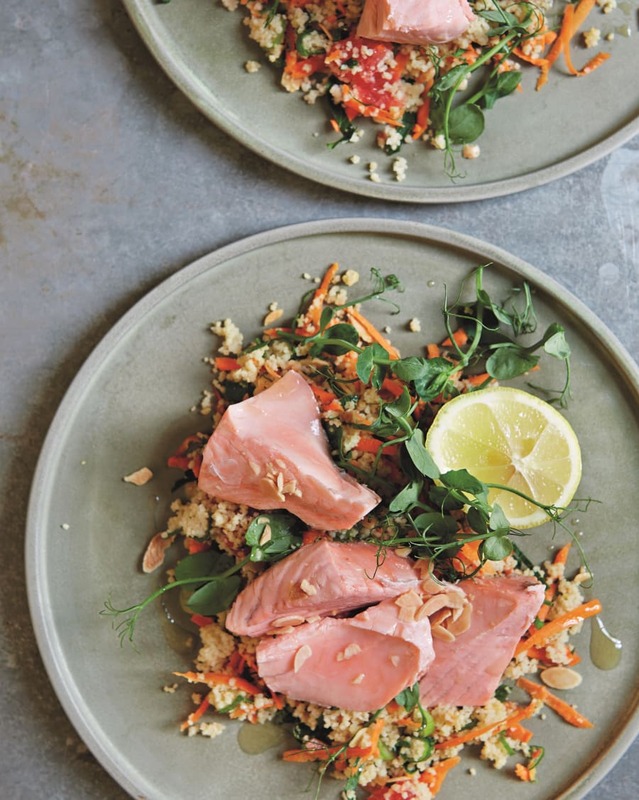 The simple poached salmon pairs perfectly with herby and zesty grapefruit couscous, while the almonds add crunch. "The couscous can also be served with a variety of other fish or meats, or topped with grilled vegetables, salad leaves and toasted mixed seeds and nuts," Gordon said. Top couscous tip: never use boiling water to soak your couscous -- it makes it clump together. 1. Mix the couscous with 100ml (scant ½ cup) of tepid water and ¼ teaspoon of salt and leave for five minutes. Mix in the grated carrot and olive oil and leave for an additional five minutes. Trim both ends from the spring onions. Thinly slice the green parts and mix into the couscous. Pick the parsley leaves from their stalks (keep the stalks), coarsely shred and add to the couscous. 2. Put the parsley stalks and spring onion white ends in a pan. Add water to a depth of 4cm and one teaspoon of salt, bring to the boil then reduce to a rapid simmer. Peel three strips of rind from the grapefruit, avoiding any white pith, and add to this poaching stock as it heats up. 3. Gently lower the salmon pieces into the simmering stock, skin side facing down, and bring back to the boil. 4. Turn off the heat, put a lid on the pan and leave for 8–10 minutes, by which time it will be cooked (if the salmon is thin and submerged then leave it for no more than 4–5 minutes). 5. Meanwhile, segment the grapefruit. Cut each segment into three or four pieces and mix into the couscous along with the almonds and any juice you can squeeze from the grapefruit core. 6. To serve, divide the couscous among your plates and sit the pea shoots on top. Remove the salmon carefully from the poaching liquid and lay on a plate, skin side facing up. Peel off the skin and scrape away any dark-coloured flesh (the blood line) under the skin using a teaspoon. Break the salmon into flakes and sit it on top of the couscous. Tuck in a lemon half. The key to a delicious salad is using your favourite ingredients and transforming them with herbs and spices. This salad is filling and complex in flavour -- two terms you wouldn't usually use to describe salad. Packed with roast carrots, fennel, onion, garlic and chilli -- as well as butter and runny eggs -- this salad is as heavenly as it is hearty. "Like quinoa, which you could use in this salad instead of the millet, it's great added to salads almost as a bulking agent rather than as the main attraction," Gordon said. "Serve with lots of hot, buttered crusty toast and grilled chorizo if you like." Serves four as a brunch dish. 1. Preheat the oven to 180°C (350°F/Gas mark 4). Put the carrots, fennel, onion, garlic and chilli in a roasting dish and toss together with a little salt and pepper. Dot on three quarters of the butter and roast in the oven, turning them once or twice while they cook until golden -- about 25 minutes. Keep warm. 2. While the vegetables are roasting, cook the millet. Half-fill a medium pan with water and bring to the boil. Meanwhile, dry-toast the millet in a frying pan on a medium–high heat for 3½ minutes, shaking or stirring it several times to prevent it from catching. Tip the millet carefully into the boiling water and add the remaining butter and ½ teaspoon of salt. Cover the pan and cook on a low heat for 12 minutes. Taste a few grains: they should have a little bite. Drain the millet into a sieve, then return it to the pan, cover and keep warm. 3. To cook the eggs, it helps if you have a cardboard egg box to hand. Heat 7mm of vegetable oil in two medium (or one large) frying pans until it gives off a shimmer of heat (at about 190°C/375°C/Gas mark 5). Crack open the eggs and tip their whites into four individual cups or ramekins. Put the yolks in their half-shells back in the egg box (to keep them upright). Carefully lower the whites into the hot oil and cook until they begin to crisp on the outside edges. Using a metal spoon, carefully spoon a little hot oil over the white to make it firm a little. Lower the yolks back onto the now semi-cooked whites. Drizzle a teaspoon of hot oil over the top of the yolk to help secure it, then remove from the pan. 4. To serve, toss the veggies, millet and spinach together and divide among warmed plates. 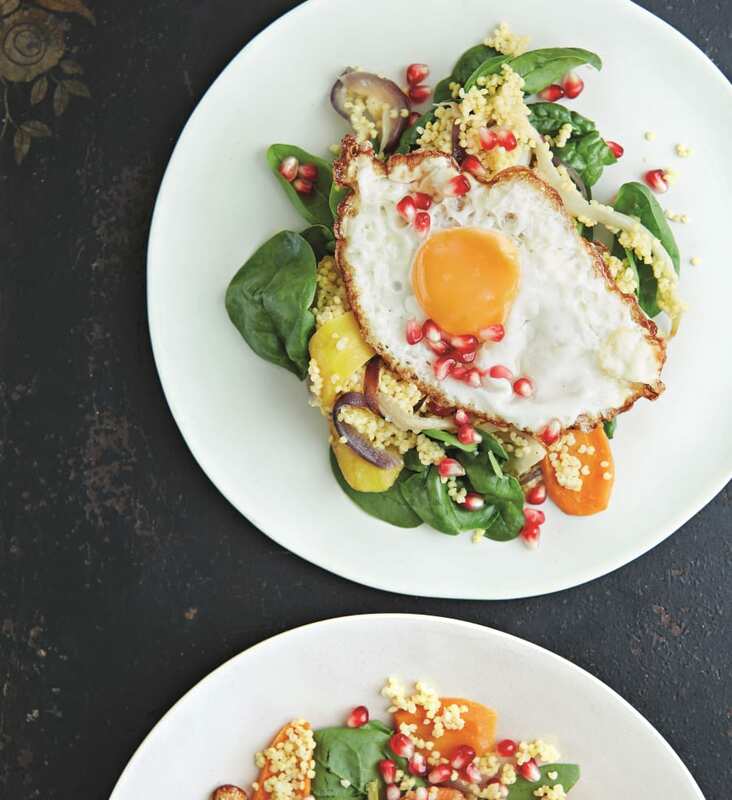 Sit an egg on top, scatter with the pomegranate and drizzle with olive oil. Don't forget the pomegranate arils for extra colour. 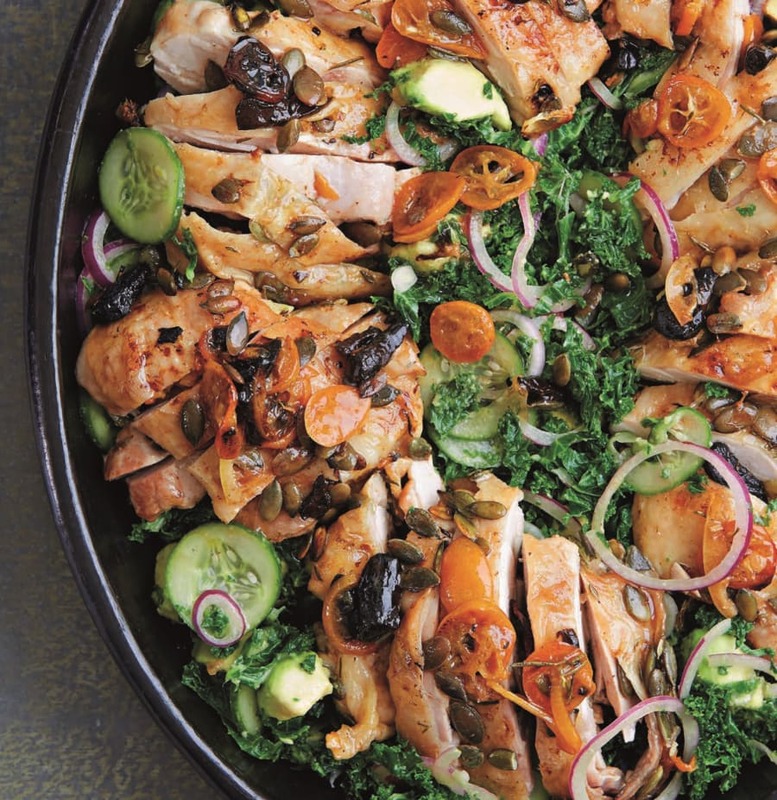 If you're bored of your standard chicken breast salad, this recipe is for you. By roasting chicken with black garlic, kumquats, rosemary and sunflower seeds, a simple salad is transformed into a flavourful, warming and filling meal. "Black garlic is a delicious fermented garlic that adds a lovely treacle-caramel flavour and depth to dishes without a strong raw-garlic aftertaste. It is becoming easier to find but if you have no luck, you can use regular garlic," Gordon said. "Kumquats are great here, too, adding a slight bitterness because you use them unpeeled. If unavailable, substitute thinly sliced lemon, mandarins or oranges." 2. Place the chicken thighs, garlic, kumquats, rosemary and sunflower seeds in a roasting dish. Pour on the avocado oil and two tablespoons of water and season with salt and pepper. Toss everything together. Roast, turning the chicken several times while cooking, until the chicken is cooked through and the skin is golden and crispy -- about 30-40 minutes. Remove from the oven and leave until cool enough to handle, then cut each thigh into four or five slices. 3. While the chicken is cooking, soak the onion rings in cold water for 10 minutes, then drain. Meanwhile, blanch or steam the kale for three minutes. Tip it into a colander and, when it is cool enough to handle, squeeze out as much water as you can, then coarsely shred it. 4. Remove the flesh from the avocados and cut into chunks. Mix with the lemon juice to prevent it going brown. 5. To serve, toss the kale, onion, cucumber and avocado together and lay it on the bottom of a serving dish. Lay the chicken on top then spoon over the contents of the roasting dish. 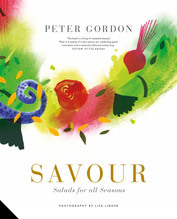 Recipes and images from Savour: Salads for all Seasons by Peter Gordon (Jacqui Small) RRP $49.99 available now in all good bookstores and online.